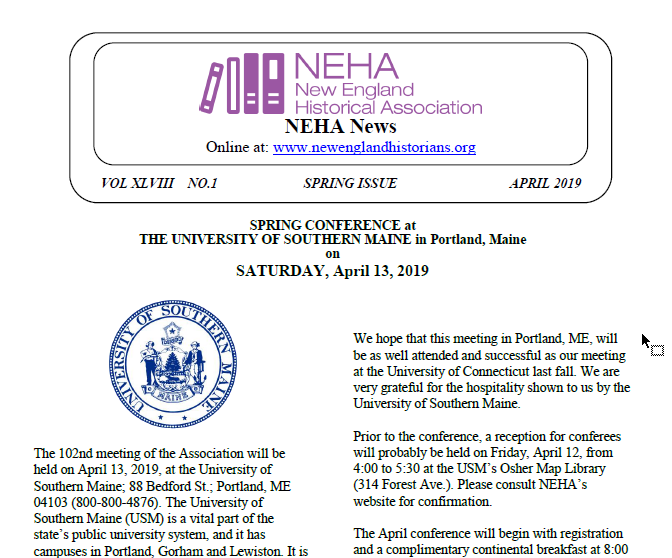 The New England Historical Association will co-sponsor a THATCamp, to be held on Wentworth Institute of Technology’s campus on March 25th. For those who are unfamiliar with THATCamps, they are informal (usually) 1-day digital humanities workshops (“unconferences”) that bring together humanities and technology people to learn new DH techniques. They are intended to be welcoming to participants of variable technical skill, and low-cost or free. These workshops originated with the Roy Rosenzweig Center for History and New Media at George Mason University, and are now overseen by the Corporation for Digital Scholarship. This March’s THATCamp was co-organized by NEHA Executive Council member Jessica Parr (UNH, Manchester and Simmons) and Ella Howard (Wentworth Institute of Technology). We are fortunate to offer this event free of charge, and with a continental breakfast sponsored by the Digital Humanities program at Wentworth Institute of Technology. The New England Historical Association has funded an afternoon coffee (because DH runs on caffeine!). Reclaim Hosting, a hosting service catering to academics and cultural institutions has generously donated three one-year 2 MB accounts for us to raffle off. We will also welcome speakers from the Digital Public Library of America, the Norman Leventhal Map Center of Boston Public Library, the American Antiquarian Society, Massachusetts Historical Society, Brown University’s Center for Digital Scholarship, and Boston’s Municipal Archives. Our theme is “digital pedagogy,” so this camp will be of most benefit to those who work with undergraduate students, as well as staff at smaller museums, libraries, and archives. Most of the agenda will set the day of the workshop, in response to participant interests, and availability of other participants who are qualified to teach workshops in the targeted skills. We will have space for up to 90 people, on a first-come, first served basis, with registration beginning February 1st. If we fill up, we will keep a waiting list, and accept registrations off that list as they come available.